Not to be confused with Duchy of Brunswick-Lüneburg. 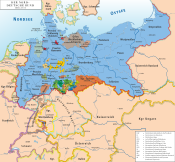 The Duchy of Brunswick (German: Herzogtum Braunschweig) was a historical German state. Its capital was the city of Brunswick (Braunschweig). It was established as the successor state of the Principality of Brunswick-Wolfenbüttel by the Congress of Vienna in 1815. In the course of the 19th-century history of Germany, the duchy was part of the German Confederation, the North German Confederation and from 1871 the German Empire. It was disestablished after the end of World War I, its territory incorporated into the Weimar Republic as the Free State of Brunswick. The Principality of Brunswick-Wolfenbüttel in 1645. The title "Duke of Brunswick and Lüneburg" (German: Herzog zu Braunschweig und Lüneburg) was held, from 1235 on, by various members of the Welf (Guelph) family who ruled several small territories in northwest Germany. These holdings did not have all of the formal characteristics of a modern unitary state, being neither compact nor indivisible. 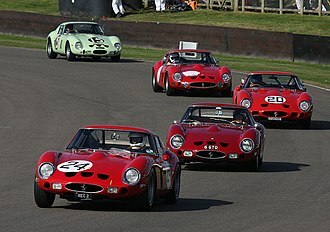 When several sons of a Duke competed for power, the lands often became divided between them; when a branch of the family lost power or became extinct, the lands were reallocated among surviving members of the family; different dukes might also exchange territories. The unifying element of all these territories was that they were ruled by male-line descendants of Duke Otto I (ruled 1235-1252). After several early divisions, Brunswick-Lüneburg re-unified under Duke Magnus II (d. 1373). Following his death, his three sons jointly ruled the Duchy. After the murder of their brother Frederick I, Duke of Brunswick-Lüneburg, brothers Bernard and Henry redivided the land, Henry receiving the territory of Wolfenbüttel. William received Wolfenbüttel proper but died in 1292. Wolfenbüttel fell to his brother Albert II. Ernest became Prince of Göttingen 1344–1367. Magnus II with the Necklace, Prince of Wolfenbüttel 1369–1373, claimed the Principality of Lüneburg against Albert of Saxe-Wittenberg. The War of the Lüneburg Succession continued until 1388. Bernard, 1409–1428. Returned control of Wolfenbüttel to his nephew, Henry's son. Henry the Peaceful 1432–1473, moved the residence to Wolfenbüttel. William IV 1484–1491. Took control of all of Wolfenbüttel, then ceded Wolfenbüttel to his sons. Died 1495. Eric I 1491–1494. Divided the territory in 1494, taking Calenberg. Henry IV 1491–1514. Sole ruler in Wolfenbüttel from 1494. Henry V 1514–1568. Son of Henry IV. Converted to Lutheranism. Julius 1568–1589. Son of Henry V. Acquired Calenberg in 1584 on the death of his cousin Eric II. Frederick Ulrich 1613–1634, son. Last of the male descendants of Albert the Tall. On Frederick Ulrich's death, his complex of territories passed to a line of distant cousins ruling in Lüneburg. Wolfenbüttel was eventually awarded[by whom?] to Augustus, son of Henry of Dannenberg. Anthony Ulrich 1685–1702, 1704–1714. Disputed with Hanover. Deposed 1702–1704 for allying with France in the War of the Spanish Succession. Converted to Catholicism 1709. Ferdinand Albert March–September 1735. Grandson of Augustus the Younger. Charles I 1735–1780. Son of Ferdinand Albert. Moved the ducal court from Wolfenbüttel to Braunschweig in 1753. Charles William Ferdinand 1780–1806. Son of Charles I. Died in battle at Jena. Frederick William 1806–1807, 1813–1815. Son of Charles William Ferdinand. During the Napoleonic Wars, from 1806 to 1813, France occupied Brunswick-Wolfenbüttel. Died in battle at Quatre Bras. Frederick William's son Charles (a minor at the time of his father's death) became the first Duke of independent Brunswick. The territory of Wolfenbüttel was recognized as a sovereign state by the Congress of Vienna in 1815. It had been a portion of the medieval Duchy of Brunswick-Lüneburg. From 1705 onward, all other portions of Brunswick-Lüneburg except Wolfenbüttel had been held by the Prince of Calenberg and Celle, i.e. the Elector of Hanover, but the Wolfenbüttel line retained its independence from Hanover. 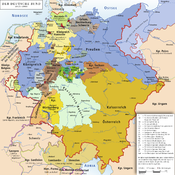 The Wolfenbüttel principality had for the period from 1807 to 1813 been held as part of the Kingdom of Westphalia. The Congress turned it into an independent country under the name Duchy of Brunswick. The underage Duke Charles, the eldest son of Duke Frederick William (who had been killed in action), was put under the guardianship of George IV, the Prince Regent of the United Kingdom and Hanover. First, the young duke had a dispute over the date of his majority. Then, in 1827, Charles declared some of the laws made during his minority invalid, which caused conflicts. After the German Confederation intervened, Charles was forced to accept those laws. His administration was considered corrupt and misguided. In the aftermath of the July Revolution in 1830, Charles finally had to abdicate. His absolutist governing style had alienated the nobility and bourgeoisie, while the lower classes were disaffected by the bad economic situation. During the night of 7–8 September 1830, the ducal palace in Braunschweig was stormed by an angry mob, set on fire and destroyed completely. Charles fled the country. When Charles' brother William VIII arrived in Brunswick on 10 September, he was received joyfully by the people. William originally considered himself only his brother's regent, but after a year declared himself ruling duke. Charles made several desperate attempts, unsuccessfully, to depose him. William left most government business to his ministers, and spent most of his time outside of his state at his possessions in Oels. After the revolution of 1830, liberal reforms were made and a new constitution was adopted on 12 October 1832. While the number of voters was limited by a system of census suffrage to about 40% of Brunswick's male population, the parliament of Brunswick was granted more rights than in most other German states at the time and the duke's budget and powers were significantly limited. While William joined the Prussian-led North German Confederation in 1866, his relationship to Prussia was strained, since Prussia refused to recognize Ernest Augustus, Crown Prince of Hanover, his nearest male-line relative, as his heir. While the Kingdom of Hanover was annexed by Prussia in 1866, the Duchy of Brunswick remained sovereign and independent. It joined first the North German Confederation and in 1871 the German Empire. William VIII ruled the Duchy of Brunswick for more than 50 years (1830–1884). In the 1870s, it became obvious that the then senior branch of the ruling House of Welf would die with Duke William. By house law, the House of Hanover would have ascended the ducal throne. However, the Hanoverians still refused to accept the Prussian annexation of their kingdom. As a result, there was strong Prussian pressure against having George V of Hanover or his son, the Duke of Cumberland, succeed to Brunswick without severe conditions, including swearing allegiance to the German constitution and renouncing all claim to Hanover. By a law of 1879, the Duchy of Brunswick established a temporary council of regency to take over at the Duke's death, and if necessary appoint a regent if the Duke of Cumberland were unable to succeed. With William's death in 1884, the Wolfenbüttel line came to an end. The Duke of Cumberland then proclaimed himself Duke of Brunswick. However, since he still claimed to be the rightful King of Hanover, the Federal Council ruled that he would violate the peace of the German Empire if he succeeded to Brunswick. Lengthy negotiations ensued, but were never resolved. Two regents were appointed: first, Prince Albert of Prussia until his death in 1906, and then Duke John Albert of Mecklenburg. Ernest Augustus, the last Duke of Brunswick. The need for a Regent ended in 1913. The Duke of Cumberland's eldest son having died in 1912, the elderly Duke renounced Brunswick in favor of his youngest son, Ernest Augustus, who married Emperor Wilhelm II's daughter, swore allegiance to the German Empire, and renounced all claims to Hanover. Accordingly, he was allowed to ascend the throne of the Duchy in November 1913. In the midst of the German revolutions of 1918, the Duke had to abdicate, and the Free State of Brunswick was founded as a member state of the Weimar Republic. 1815–1830: Charles II, son of Frederick William. Forced to flee Brunswick in 1830 and succeeded by his brother. 1830–1884: William VIII. Brother of Charles II. Last of the Brunswick line, following which the legal succession passed to the Hanoverian royal family, which had been dispossessed by Prussia following the Austro-Prussian War of 1866. 1885–1906: Albert, Prince of Prussia, regent. The German government prevented the succession of the Hanoverian Duke of Cumberland to the throne of Brunswick and substituted a Prussian regent for the Duke. For further information on the governments of Brunswick from 1918 on, see Free State of Brunswick. Brunonia, national personification of Brunswick. The Duchy of Brunswick and neighbouring states in 1905. The Wurmberg, highest peak of Brunswick, seen from Braunlage c. 1900. 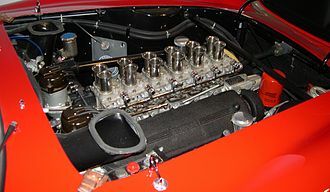 The Duchy of Brunswick consisted of several non-connected parts - three larger and seven smaller ones. The biggest and most populous of those was the area surrounding the cities of Braunschweig, Wolfenbüttel and Helmstedt as well as the Elm, which extended from the river Aller in the north to the Harz mountains in the south. The western part with the town of Holzminden extended from the river Weser in the east to the Harz Foreland in the west. The southern part with the town of Blankenburg was located in the Harz mountains. The Duchy's smaller exclaves were Thedinghausen near Bremen, Harzburg, Calvörde, Bodenburg and Östrum, Ostharingen near Goslar, Ölsburg near Peine and a small woodland near the Fallstein. The Duchy of Brunswick was almost entirely surrounded by the Prussian Provinces of Hanover and Saxony, in the south-east it also bordered the Duchy of Anhalt and in the west the Principality of Waldeck-Pyrmont and the Prussian Province of Westphalia. The western part of the Duchy lay in the Weser Uplands, the central and southern parts in the northern Harz Foreland and the Harz mountains. The northern part was located on the border between the North German Plain and the Central Uplands of Germany. The Duchy's highest peak was the Wurmberg at 971 metres (3,186 ft). The major rivers that ran through Brunswick were the Weser, Aller, Leine, Oker, Bode and Innerste. 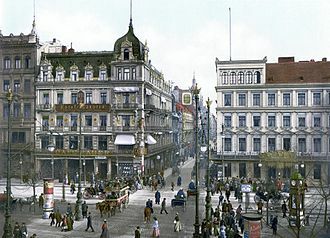 Braunschweig, capital and largest city of Brunswick, c. 1900. Wolfenbüttel Castle in the mid-19th century. The Duchy of Brunswick was subdivided into six districts (Kreise) in 1833. The districts were further subdivided into cities or towns (Städte) and more rural townships (Ämter). 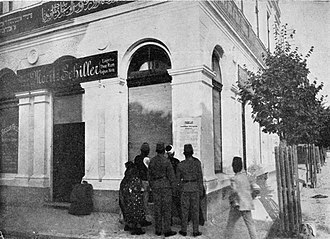 Helmstedt market place in 1891. In 1910, the Duchy of Brunswick had a population of 494,339 people. According to the 1885 census, 84.90% (316,208 people) of the Duchy's inhabitants held citizenship of Brunswick, while 54,738 people (14.70%) were citizens of other German states. 1506 people (0.40%) were foreign nationals, among those 785 came from Austria-Hungary, 133 from the United Kingdom, 112 from the United States, 91 from Italy, 83 from the Russian Empire, and 81 from Switzerland. In 1905, 450,760 people or 92.5% of the population adhered to the Evangelical Lutheran Church in Brunswick. 26,504 (5.5%) people were Catholic, 4720 (0.97%) adhered to Reformed churches. 1815 (0.39%) people were of Jewish faith. In 1905, out of 1,000 residents 455 were working in the industrial sector, mining or construction, 289 were working in agriculture and forestry, 121 in commerce, 57.3 were employed in the civil service and 70 were working in miscellaneous other professions. The Duchy of Brunswick State Railway was the first state railway in Germany. The first section of its Brunswick–Bad Harzburg railway line connecting Braunschweig and Wolfenbüttel opened on 1 December 1838, as the first railway line in Northern Germany. In the 1870s, the Duchy of Brunswick State Railway merged with the Royal Prussian State Railways. Some other railways of secondary importance were operated by the Brunswick State Railway Company, founded in 1884. In 1847, MTV Braunschweig was founded as the first sports club in Brunswick. Brunswick also played a pioneering role in the history of association football in Germany: Konrad Koch, a school teacher from Braunschweig, was the first to write down a German version of the rules of football, and, together with August Hermann, also arguably organized the first football match in Germany between pupils from his school Martino-Katharineum in 1874. The Duchy of Brunswick Football Association (German: Fußballbund für das Herzogtum Braunschweig) was founded in May 1904. Eintracht Braunschweig, founded in 1895, quickly became one of the leading football clubs in Northern Germany. To this day, the team plays in the colours blue and yellow, derived from the flag of Brunswick. The arms of the Duchy of Brunswick since 1834. The Duchy of Brunswick-Lüneburg was formed out of the possessions of senior branch of the House of Brunswick. 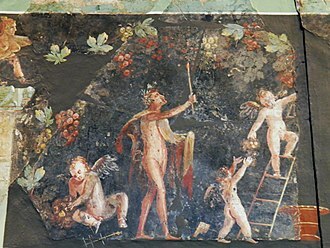 The House of Brunswick originated from the Italian House of Este. This family acquired the inheritance of the Guelph family by marriage — around the year 1000 — of Azzo II with Kunigunde of Altdorf, daughter of Welf II. Again important possessions were gained in (Lower) Saxony by the marriage of Henry the Black to Wulfhilde of Saxony (d 1126), daughter of the last member of the House of Billung, who had been Dukes of Saxony for five generations. They were made Dukes of Brunswick-Lüneburg in 1235. In 1269 the house of Brunswick-Lüneburg divided into the branches of Lüneburg and Brunswick (later Brunswick-Wolfenbüttel, the later Duchy of Brunswick). In 1432 the Principality of Calenberg, the later Electorate of Hanover, split from Brunswick(-Wolfenbüttel), and in 1705 acquired the territory of Lüneburg. Both branches used in their arms the two lions of Brunswick, the blue lion of Lüneburg and the white steed of Saxony. The use of the lion as a heraldic animal in the House of Guelph goes back to Henry the Lion in the 12th century at least. However, Henry used only a single lion as his symbol. Later accounts by medieval writers that the two golden lions of Brunswick were granted to Henry by the English king, his father-in-law, are deemed fictional by modern historians. It were Henry's sons from his marriage with Matilda of England, the future Holy Roman Emperor Otto IV and Henry V, Count Palatine of the Rhine, who adapted the Royal Arms of England to display their royal lineage. While Otto's coat of arms showed the three golden lions of England, Henry used only two. The two lions of Henry V then went on to become the symbol of the House of Guelph. The blue lion of Lüneburg was adopted by John I of Lüneburg, who based his coat of arms on the coat of arms of Denmark to emphasise his kinship with the Danish kings. The dukes of Brunswick later added the blue lion to their arms as well, to show their own claim to the territory of Lüneburg. The white steed was said to be the emblem of the eighth century Saxon duke Widukind, who according to legend rode a black horse before his baptism and a white horse afterwards. In truth, the use of the horse as a symbol for Saxony only goes back to the 14th century, when the House of Guelph, after the ducal title of Saxony had fallen to the House of Ascania, adopted the fictional "ancient" symbol to represent themselves as the true descendants of the old Saxon dukes. Due to the legend associated with it, the white horse became a very popular symbol among the population of Brunswick, even more so than the lions. Over time, the arms of smaller territories that had been acquired by the Dukes of Brunswick were added to the coat of arms. The coat of arms of the Duchy of Brunswick eventually consisted of a crown and shield, supported by two wild men, on which the blue lion of Lüneburg, the two golden lions of Brunswick, the Saxon steed and the arms of various counties were displayed. The lesser coat of arms of the Duchy of Brunswick showed a crowned shield with the white horse on a red background. The Saxon steed was dropped from the coat of arms during the reign of William VIII. The greater coat of arms of the Duchy of Brunswick, as adopted in 1834, shows a shield with a ducal crown on top and surrounded by the insignia of the Order of Henry the Lion. Displayed on the shield are, from left to right, the blue lion of Lüneburg, the two lions of Brunswick, and the arms of the Counts of Eberstein, Homburg, Diepholz (upper half), Lauterberg, Hoya and Bruchhausen, Diepholz (lower half), Honstein, Regenstein, Klettenberg and Blankenburg. The new lesser coat of arms introduced under William VIII was a return to the arms of Brunswick-Lüneburg, displayed on a crowned shield supported by two lions. The Latin inscriptions read IMMOTA FIDES ("unswerving faithfulness") and NEC ASPERA TERRENT ("they are not afraid of difficulties"). The flag of the Duchy of Brunswick was blue over yellow, and demonstrates a remarkable similarity with the Ukrainian national colours. The standard of the dukes of Brunswick given by Siebmachers Wappenbuch, Nuremberg 1878, shows the white horse on a red cloth - this, however, is today assumed to have been in error. The state flag introduced in 1912 was blue over yellow, with a crowned shield with the white horse on a red background in the center. Saxon steed on an 1860s stamp of Brunswick. Coat of arms on 1866 Vereinsthaler of Brunswick. Richard Andree: Braunschweiger Volkskunde. 2nd edition. 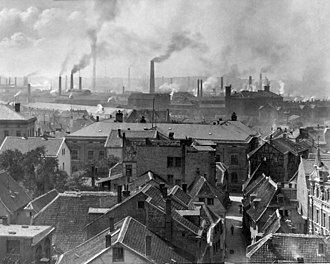 Vieweg, Braunschweig 1901. F. Fuhse (ed. ): Vaterländische Geschichten und Denkwürdigkeiten der Lande Braunschweig und Hannover, Band 1: Braunschweig. 3rd edition. Appelhans Verlag, Braunschweig 1925. Hermann Guthe: Die Lande Braunschweig und Hannover. Mit Rücksicht auf die Nachbargebiete geographisch dargestellt. Klindworth's Verlag, Hannover 1867. Otto Hohnstein: Geschichte des Herzogtums Braunschweig. F. Bartels, Braunschweig 1908. Horst-Rüdiger Jarck, Gerhard Schildt (eds. ): Die Braunschweigische Landesgeschichte. Jahrtausendrückblick einer Region. 2nd edition. Appelhans Verlag, Braunschweig 2001, ISBN 3-930292-28-9. Jörg Leuschner, Karl Heinrich Kaufhold, Claudia Märtl (eds. ): Die Wirtschafts- und Sozialgeschichte des Braunschweigischen Landes vom Mittelalter bis zur Gegenwart. 3 vols. Georg Olms Verlag, Hildesheim 2008, ISBN 978-3-487-13599-1. Richard Moderhack (ed. ): Braunschweigische Landesgeschichte im Überblick. 3rd edition, Braunschweigischer Geschichtsverein, Braunschweig 1979. E. Oppermann: Landeskunde des Herzogtums Braunschweig. Geschichte und Geographie. E. Appelhans, Braunschweig 1911. Werner Pöls, Klaus Erich Pollmann (eds. ): Moderne Braunschweigische Geschichte. Georg Olms Verlag, Hildesheim 1982, ISBN 3-487-07316-1. Henning Steinführer, Gerd Biegel (eds. ): 1913 – Braunschweig zwischen Monarchie und Moderne. Appelhans Verlag, Braunschweig 2015, ISBN 978-3-944939-12-4. ^ "Cable News". Fielding Star. 1 June 1907. p. 2. ^ "Die Wiege des Fußballs stand in Braunschweig" (PDF) (in German). Retrieved 8 August 2012. ^ "Der Mann, der die "englische Krankheit" einschleppte" (in German). einestages.spiegel.de. Retrieved 2 September 2013. Wikisource has the text of the 1911 Encyclopædia Britannica article Brunswick (German duchy). Wikimedia Commons has media related to Duchy of Brunswick. The Goldmark was the currency used in the German Empire from 1873 to 1914. The Papiermark refers to the German currency from 4 August 1914 when the link between the Mark and gold was abandoned. Before unification, the different German states issued a variety of different currencies, though most were linked to the Vereinsthaler, a silver coin containing 16⅔ grams of pure silver. Although the Mark was based on rather than silver, a fixed exchange rate between the Vereinsthaler and the Mark of 3 Mark =1 Vereinsthaler was used for the conversion. Southern Germany had used the Gulden as the unit of account. Bremen had used a gold based Thaler which was converted directly to the Mark at a rate of 1 gold Thaler =3.32 Mark, Hamburg had used its own Mark prior to 1873. This was replaced by the Goldmark at a rate of 1 Hamburg Mark =1.2 Goldmark, from 1 January 1876 onwards, the Mark became the only legal tender. The name Goldmark was created to distinguish it from the Papiermark which suffered a loss of value through hyperinflation following World War I. The goldmark was on a standard with 2790 Mark equal to 1 kilogram of pure gold. From 1900 to 1933, the United States adhered to a standard as well. The goldmark therefore had a value of approximately U. S. $0.25, the monetary hegemon of the time when the goldmark was in use, was the Pound Sterling, with £1 being valued at 20.43 goldmarks. The actual total payout from 1920 to 1931 was 20 billion German goldmarks, most of that money came from loans from New York bankers. Following the Nazi seizure of power in 1933, payments of reparations were officially abandoned, the interest on those debts was paid off on 3 October 2010, the 20th anniversary of German reunification. Occasionally Commemorative coins were minted, in cases the obverse. Many of the states issued coins in very small numbers. Also, in all states coinage became very limited after the First World War began. Well preserved examples of such low mintage coins can be rare, the Principality of Lippe was the only state not to issue any gold coins in this period. The Duchy of Saxe-Wittenberg was a medieval duchy of the Holy Roman Empire centered at Wittenberg, which emerged after the dissolution of the stem duchy of Saxony. The Ascanian dukes prevailed in obtaining the Saxon electoral dignity until their duchy was elevated to the Electorate of Saxony by the Golden Bull of 1356. The Eastphalian count Otto of Ballenstedt, ancestor of the House of Ascania, had married Eilika, as the Billung male line became extinct upon Magnuss death in 1106, Otto hoped to succeed him, however King Henry V of Germany enfeoffed Count Lothair of Supplinburg. During the following long-term dispute between Henry and Lothair, Otto was able to gain the title of a Saxon duke, Lothair was elected King of the Romans in 1125 and in 1134 he vested Ottos son Albert the Bear with the Saxon Northern March. Upon his death in 1137, Albert once again strived for the Saxon duchy, his rule was strongly contested by the local nobility and in 1142 Albert finally had to resign as duke in favour of Henry the Prouds son Henry the Lion. 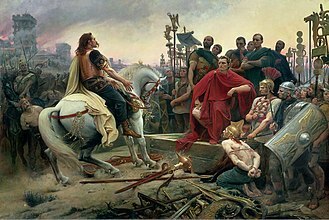 Albert took part in the Wendish Crusade of 1147 and in 1157 established the Margraviate of Brandenburg, the third chance for the Ascanians came, when in 1180 ambitious Henry the Lion was deposed as Saxon Duke by Emperor Frederick Barbarossa. Frederick partitioned Saxony among his allies into more than a dozen immediate territories, among the supporters, Archbishop Philip of Cologne received the largest share as the newly created Duchy of Westphalia. The Saxon ducal title at least passed to late Alberts youngest son, Count Bernhard of Ballenstedt, after Albert Is death in 1260 his two heirs, John I and his younger brother Albert II ruled jointly. He consolidated his position by marrying Agnes, daughter of Rudolph of Habsburg, Alberts attempts to secure the succession in the lands of the extinct Counts of Brehna were more successful, when their fiefs were reverted to the Empire in 1290, the king enfeoffed his son Rudolph. In 1295 Albert II could again enlarge his Saxon territory, when he acquired the County of Gommern, the last document, mentioning the joint government of Albert II with his nephews as Saxon fellow dukes dates back to 1295. The Vierlande, the Land of Ratzeburg, the Land of Darzing, Duke Albert II received the Wittenberg lands around the eponymous city and Gommern. He thus became the founder of the Ascanian line of Saxe-Wittenberg, when Rudolph succeeded his father Albert II as Duke of Saxe-Wittenberg in 1298, he and the Dukes of Saxe-Lauenburg rivallingly claimed the Saxon electoral privilege. Upon the assassination of his brother-in-law King Albert I in 1308, in 1314 both duchies participated in the double election of the German kings, Frederick III, the Fair from the House of Habsburg and his Wittelsbach cousin Louis IV, the Bavarian. However, only Louis the Bavarian, co-elected with Saxe-Lauenburgs vote, Rudolph I in turn allied with the rivaling House of Luxembourg. He supported Count Charles IV of Luxembourg as anti-king to Louis IV and on that account exclusively received the Saxon electoral dignity with the Golden Bull of 1356, Saxe-Wittenberg thereupon came to be known as the Electorate of Saxony. When the Ascanian line in the Electorate of Saxony died out in 1422, King Sigismund granted the Electorate to Margrave Frederick IV of Meissen from the House of Wettin, who united the Meissen and the Saxon lands of Wittenberg under his rule. World War I, known as the First World War, the Great War, or the War to End All Wars, was a global war originating in Europe that lasted from 28 July 1914 to 11 November 1918. More than 70 million military personnel, including 60 million Europeans, were mobilised in one of the largest wars in history and it was one of the deadliest conflicts in history, and paved the way for major political changes, including revolutions in many of the nations involved. The war drew in all the worlds great powers, assembled in two opposing alliances, the Allies versus the Central Powers of Germany and Austria-Hungary. These alliances were reorganised and expanded as more nations entered the war, Japan, the trigger for the war was the assassination of Archduke Franz Ferdinand of Austria, heir to the throne of Austria-Hungary, by Yugoslav nationalist Gavrilo Princip in Sarajevo on 28 June 1914. This set off a crisis when Austria-Hungary delivered an ultimatum to the Kingdom of Serbia. Within weeks, the powers were at war and the conflict soon spread around the world. On 25 July Russia began mobilisation and on 28 July, the Austro-Hungarians declared war on Serbia, Germany presented an ultimatum to Russia to demobilise, and when this was refused, declared war on Russia on 1 August. Germany invaded neutral Belgium and Luxembourg before moving towards France, after the German march on Paris was halted, what became known as the Western Front settled into a battle of attrition, with a trench line that changed little until 1917. On the Eastern Front, the Russian army was successful against the Austro-Hungarians, in November 1914, the Ottoman Empire joined the Central Powers, opening fronts in the Caucasus and the Sinai. In 1915, Italy joined the Allies and Bulgaria joined the Central Powers, Romania joined the Allies in 1916, after a stunning German offensive along the Western Front in the spring of 1918, the Allies rallied and drove back the Germans in a series of successful offensives. By the end of the war or soon after, the German Empire, Russian Empire, Austro-Hungarian Empire, national borders were redrawn, with several independent nations restored or created, and Germanys colonies were parceled out among the victors. The Principality of Grubenhagen was a subdivision of the Duchy of Brunswick-Lüneburg, ruled by the Grubenhagen line of the House of Welf from 1291. It is known as Brunswick-Grubenhagen, the principality fell to the Brunswick Principality of Lüneburg in 1617, from 1665 the territory was ruled by the Calenberg branch of the Welf dynasty. The principality was located on the edge of the Harz mountain range in present-day South Lower Saxony. The dominion comprised the eastern exclave of Elbingerode, today part of Saxony-Anhalt, Grubenhagen was split off from the Brunswick Principality of Wolfenbüttel in 1291, when the sons of late Duke Albert the Tall finally divided their heritage. Its first ruler was Duke Henry the Admirable, the ongoing fragmentation weakened the position of the Grubenhagen branch regarding estate distributions involving their Wolfenbüttel, Lüneburg and Calenberg cousins. The Principality of Grubenhagen was finally reunited in 1526 under the rule of the Brunswick duke Philip I, however, in 1596 the Grubenhagen branch became extinct upon the death of his son Philip II. The thaler was a silver coin used throughout Europe for almost four hundred years. Its name lives on in the many currencies called dollar and, until recently and this original Bohemian thaler carried a lion, from the coat of arms of the Kingdom of Bohemia, on its reverse side. Etymologically, Thal is German for valley - a thaler is a person or a thing from the valley, the Czech spelling was tolar, many varieties of the term are used in different languages. In the 1902 spelling reform, the German spelling was changed from Thal and Thaler to Tal and Taler, the roots and development of the thaler-sized silver coin date back to the mid-15th century. In 1474 a 9-gram lira was issued but it was in 1484 that Archduke Sigismund of Tirol issued the first truly revolutionary silver coin and this was a very rare coin, almost a trial piece, but it did circulate so successfully that demand could not be met. Finally, with the silver deposits—being mined at Schwaz—to work with and his mint at Hall, Sigismund issued, in 1486, large numbers of the first true thaler-sized coin, the Guldengroschen, nicknamed the guldiner, was an instant and unqualified success. Soon it was being copied widely by many states who had the necessary silver, by 1518, guldiners were popping up everywhere in central Europe. Joachim, the father of the Virgin Mary, was portrayed on the coin along with the Bohemian lion, similar coins began to be minted in neighbouring valleys rich in silver deposits, each named after the particular thal or valley from which the silver was extracted. There were soon so many of them that these coins began to be known more widely as thaler in German. From these earliest thaler developed the new thaler – the coin that the Holy Roman Empire had been looking to create as a standard for trade between the regions of Europe, the original Joachimsthaler Guldengroschen was one ounce in weight. The Empires Reichstaler was defined as containing 400.99 grains of silver, in the 17th century, some Joachimsthalers were in circulation in the Tsardom of Russia, where they were called yefimok - a distortion of the first half of the name. The zenith of thaler minting occurred in the late 16th and 17th centuries with the so-called multiple thalers, the first were minted in Brunswick, and indeed the majority were struck there. The House of Welf was a European dynasty that has included many German and British monarchs from the 11th to 20th century and Emperor Ivan VI of Russia in the 18th century. The House of Welf is the branch of the House of Este. The first member was Welf IV, he inherited the property of the Elder House of Welf when his maternal uncle Welf III, Duke of Carinthia and Verona, the last male Welf of the Elder House, died in 1055. Welf IV was the son of Welf IIIs sister Kunigunde of Altdorf and her husband Albert Azzo II of Este, in 1070, Welf IV became duke of Bavaria. Since the Welf dynasty sided with the Pope in this controversy, Henry the Black, duke of Bavaria from 1120–1126, was the first of the three dukes of the Welf dynasty called Henry. His wife Wulfhild was the heiress of the house of Billung, possessing the territory around Lüneburg in Lower Saxony and their son, Henry the Proud was the son-in-law and heir of Emperor Lothair of Supplinburg and became duke of Saxony on Lothairs death. Lothair left his territory around Brunswick, inherited from his mother of the Brunonen family and her husband Henry the Proud became the favoured candidate in the imperial election against Conrad III of the Hohenstaufen. But Henry lost the election, as the other princes feared his power and temperament, Henry the Lion recovered his fathers two duchies, Saxony in 1142, Bavaria in 1156 and thus ruled vast parts of Germany. In 1168 he married Matilda, the daughter of Henry II of England and Eleanor of Aquitaine, and sister of Richard Lionheart, gaining ever more influence. His first cousin, Emperor Frederick I of the Hohenstaufen dynasty, tried to get along with him, Henry made his peace with the Hohenstaufen Emperor in 1185, and returned to his much diminished lands around Brunswick without recovering his two duchies. Bavaria had been given to Otto I Wittelsbach, Duke of Bavaria, Henry died at Brunswick in 1195. Henrys son Otto of Brunswick was elected King of the Romans and he incurred the wrath of Pope Innocent III and was excommunicated in 1215. Otto was forced to abdicate the throne by the Hohenstaufen Frederick II. He was the only Welf to become emperor of the Holy Roman Empire, Henry the Lions grandson Otto the Child became duke of a part of Saxony in 1235, the new Duchy of Brunswick-Lüneburg, and died there in 1252. 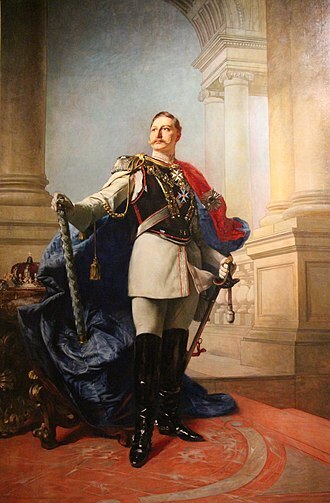 Ernest Augustus, reigning Duke of Brunswick, was a grandson of George V of Hanover, whom the Prussians deposed in 1866, and Christian IX of Denmark. Prince Ernest Augustus was born at Penzing near Vienna, the sixth and youngest child of Crown Prince Ernest Augustus of Hanover and his wife and his father succeeded as pretender to the Hanoverian throne and as Duke of Cumberland and Teviotdale in the peerage of Great Britain in 1878. The younger Prince Ernest August became heir apparent to the dukedom of Cumberland and he was a first cousin of George V of the United Kingdom, Nicholas II of Russia, and Christian X of Denmark, Haakon VII of Norway, and Constantine I of Greece. In 1884, the reigning Duke of Brunswick-Wolfenbüttel, a distant cousin, since the younger branch of the House of Ghuelph died with him, under house rules it would have passed to the Duke of Cumberland, who immediately claimed the throne. Bismarck did this because the duke had never renounced his claims to the kingdom of Hanover. Instead, Prince Albrecht of Prussia became the regent of Brunswick, when Ernests older brother, Prince George, died in an automobile accident on 20 May 1912, the German Emperor sent a message of condolence to the Duke of Cumberland. In response to this gesture, the Duke sent his only surviving son, Ernest. Ernest and the German Emperor were third cousins in descent from George III of the United Kingdom, in Berlin, Ernest met and fell in love with the Emperor William IIs only daughter, Princess Victoria Louise of Prussia. On 24 May 1913, Ernest and Victoria Louise, third cousins once removed through descent from George IIIs sons King Ernest Augustus I of Hanover and Edward and this marriage ended the decades-long rift between the Houses of Hohenzollern and Hanover. The wedding of Prince Ernest Augustus and Princess Victoria Louise was the last great gathering of European sovereigns before the outbreak of The Great War. In addition to the German Emperor and Empress and the Duke and Duchess of Cumberland, George V and Queen Mary of the United Kingdom, two imprisoned British spies Captain Stewart and Captain Trench, were pardoned and released by the Kaiser as a wedding present to the United Kingdom. George V of the United Kingdom gave his consent to the marriage on 17 March 1913 as required under the Royal Marriages Act, on 27 October 1913, the Duke of Cumberland formally renounced his claims to the duchy of Brunswick in favor of his surviving son. The following day, the Federal Council voted to allow Prince Ernest Augustus of Cumberland to become the reigning Duke of Brunswick, the new Duke of Brunswick, who received a promotion to colonel in the Zieten–Hussars, formally took possession of his duchy on 1 November. During World War I, the rose to the rank of major-general. On 8 November 1918, he was forced to abdicate his throne along with the other German kings, grand dukes, thus when his father died, in 1923, Ernest Augustus did not succeed to his fathers title of Duke of Cumberland. For the next thirty years Ernest Augustus would remain as head of the House of Hanover, the Duke of Brunswick is the maternal grandfather of Queen Sophia of Spain and the former King Constantine II of Greece. Wilhelm II, German Emperor. Oil painting by Max Koner, 1890. Landschaftliches Haus, Landtag building of the Duchy and the Free State of Brunswick. Tod des Schwarzen Herzogs (German: "Death of the Black Duke") at the Battle of Quatre Bras on 16 June 1815. An 1835 painting by Friedrich Matthäi now displayed in the Braunschweigisches Landesmuseum. The Qing Chinese celebrate a victory over the Kingdom of Tungning in Taiwan. 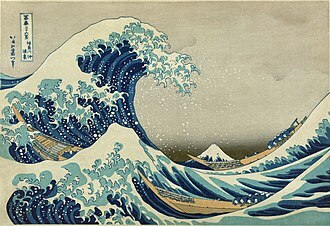 Painting was a collaboration between Chinese and European painters, 1788. Soldiers stand behind a barricade during the Spartacist uprising. Crowds outside the Reichstag on 9 November as the creation of the republic was announced. "Berlin seized by revolutionists": The New York Times on Armistice Day, 11 November 1918. 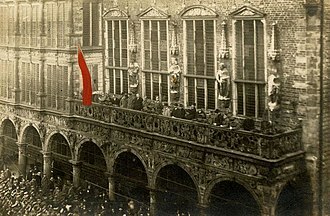 Proclamation of the Bremen revolutionary republic, outside the town hall, on 15 November 1918. The 1525 Joachimsthaler of the Kingdom of Bohemia was the first thaler. The obverse side pictures St Joachim. The reverse side features the Bohemian Lion and the name of King Ludovicus. 5 Million Mark coin would have been worth $714.29 in January 1923, about 1 thousandth of one cent by October 1923. The Limes Germanicus of the Roman Empire and modern boundaries. 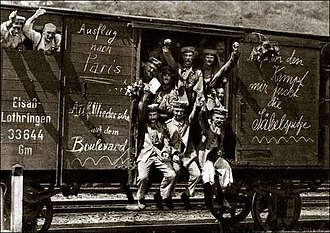 German soldiers in a railway goods wagon on the way to the front in 1914. Early in the war, all sides expected the conflict to be a short one. 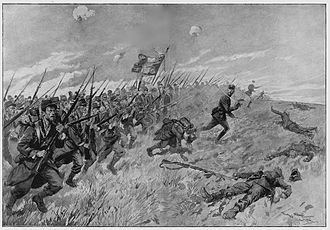 French bayonet charge, Battle of the Frontiers; by the end of August, French casualties exceeded 260,000, including 75,000 dead. Martin Luther (1483–1546), Protestant Reformer. 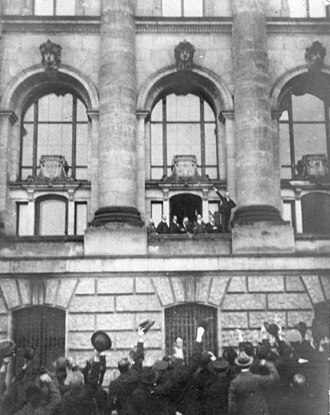 Philipp Scheidemann proclaims the German Republic from the Reichskanzlei window, on 9 November 1918. Territorial division of the Electorate of Brunswick-Lüneburg and dynastic relationships within the Duchy of Brunswick-Lüneburg and to the Kingdom of Great Britain. Talleyrand proved an able negotiator for the defeated French. 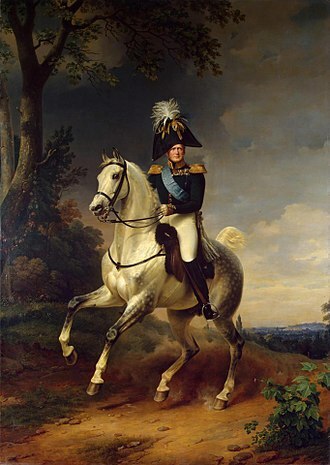 Alexander I of Russia (1812) considered himself a guarantor of European security. By winning the battle on the Strietfield at Winsen in 1388, Duke Henry I secured the Principality for the House of Welf. Rathaus, Vienna serves as City Hall and Gemeinderat. Otto the Mild and his wife Agnes of Brandenburg.